It's the sound that hits you first. That raw unmistakable bark of the Testastretta 11° that make your eyes go wide. A sound that borders on the shameless and makes you go weak in the knees every time you blip the Monster 821's throttle. But isn't that what these Ducatis are meant to do? To arouse all sorts of emotions in you the way only the Italians can. The last Monster I rode was the 796. And to me, it lacked that blood red soul of Ducati. But this one? Oh man! This one is all soul. It bleeds Ducati from every curve, every nut and every little piece of metal. If you were to see Monica Bellucci walking down the street one day, you wouldn't need Google to tell you who she is. Some things you just know. And so it is for the Monster as well. The design is clearly an evolution of the older Monsters, but sharper, sleeker and sultrier. The overall shape still remains true to the original, but there are some noticeable changes. For example, the strip of lights that ran across the middle of the headlight has been replaced by two LED parking lights on either lower side of the headlight. Also, the twin underseat exhaust has been replaced by a twin exhaust that hangs out the right side of the motorcycle. Other changes are a smaller trellis frame and the removal of those little mesh inserts on either side of the tank. However, for all its good looks, there are some issues that I have to bring up. For one, I still don't get why Ducati cannot figure out a way to hide away those cat-con bits. The way it is, it's an eyesore on an otherwise well-finished exhaust. And on the left side, there's an even bigger eyesore  the plumbing for the cooling system. The black pipes going to and from the radiator to both the cylinders look too industrial to be a part of any Ducati. And then there are the rear footpeg mounts. They bend outwards from the swingarm pivot. This means that if you are in the habit of riding on the balls of your feet, they will get in the way. I have the smallest feet here (size 42) and they still get in the way. The only solution is to tuck your heels away above the mounts, which is just odd and leave you with nothing to anchor yourself to, making cornering a big issue for me. And the footpeg rubbers that become incredibly slippery once wet don't help matters one bit. But to the Ducati's credit, it does come with a whole bunch of features that are really cool. Firstly, there is a height adjustable seat that allowed even my 5ft-8inch frame to have both feet flat on the ground. 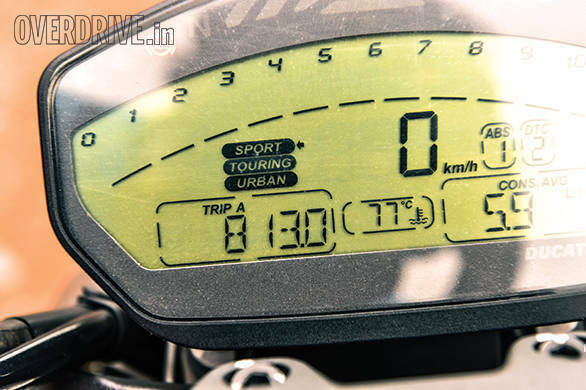 Then there is the crystal clear LCD instrumentation that gives you all the information you will ever need in an easy-to-read manner. It also comes with three riding modes, three-level ABS and eight-level traction control. The chassis on the Monster is a lot like the one on the Panigale. No, it isn't a monocoque, but the steel tubular trellis frame attaches to the cylinder head of the front cylinder. And the rear subframe and the rear suspension are attached to the rear cylinder. The layout enables it to have a low kerb weight of just about 205.5kg. The front suspension is a 43mm Kayaba upside down unit, and the rear shock is a Sachs cantilever unit. The suspension is set up stiff but isn't uncomfortable. For the amount of dynamic ability it offers, the ride quality is quite pleasant. The Monster's chassis doesn't feel like it's fighting against you anymore. The bike is eager to turn into corners, but you need a gentle hand. It is not as aggressive a steering response as the Panigale, but it's only one-step short of that. So if you're planning on tossing it into corners without a care and then recovering it, this is not the bike for it. Steering inputs need to be precise and gentle. But the reward to this is that the bike is very light on its feet. It is effortless to steer. The chassis give you a lot of confidence, and you can really go town with it through corners. And while the suspension is set up stiff, it is not uncomfortable. In fact, it leans towards a sporty setting than comfort, but without being intolerable. It soaks up the bumps and cracks on our roads very well. The tyres too are really good. 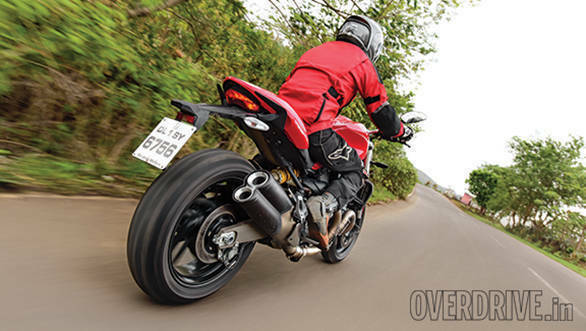 The Pirelli Diablo Rosso IIs add to this confidence and give you the ability to really lean the motorcycle over. 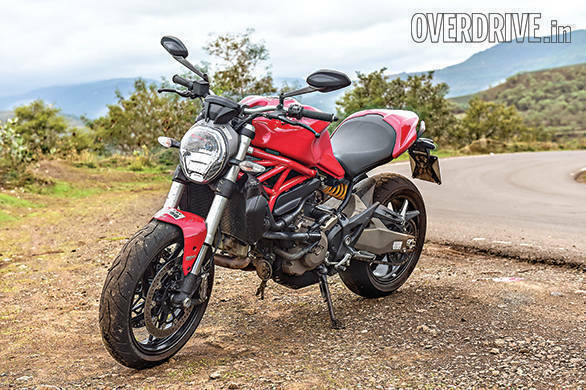 There was no alarming loss of traction even in the rain, enabling you to ride the Monster hard almost everywhere. The excellent Brembos only add to this. While they are super aggressive and take getting used to, they offer superb bite and bring the bike to a halt within no time. And the three-level ABS lets you go completely bonkers with the levers too. With the least amount of intervention, the ABS even lets you lift your rear a bit. And it never alarms you in the way it kicks in. Always predictable and effective, this ABS. 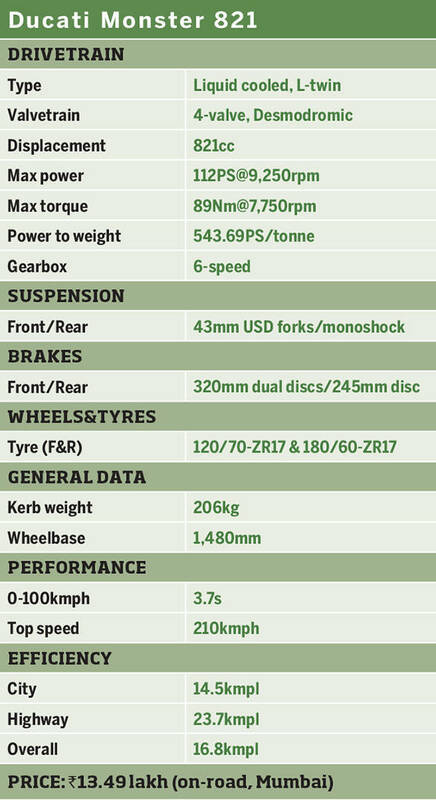 The Monster 821's Testastretta 11° is an 821cc L-twin that makes 112PS and 89.4Nm of torque. 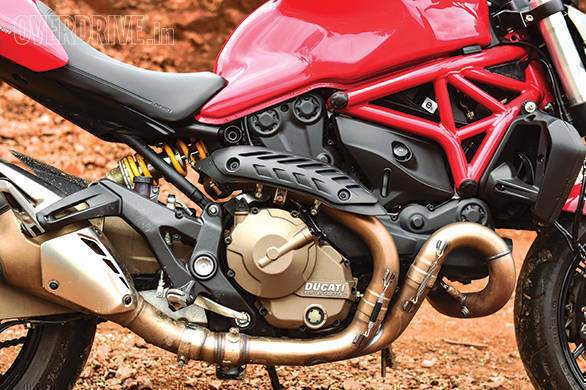 The engine uses Ducati's Desmodromic valvetrain with 11 degrees of valve overlap. The lower valve overlap (as compared to the Panigales) means that this engine is tuned for more low- and mid-range power. It makes close to 80PS and 80Nm at about 6,500rpm which is a lot of usable power. There is no more low-end unhappiness with the new engine. It doesn't sputter and threaten to die on you like the older Testastrettas. You can let the clutch out completely and let the bike roll forward with very little throttle input. And with the low-down torque, it feels effortless in traffic. You can sit on top gear from as low as 35kmph and accelerate away without drama. But there's a monster lying asleep here. The moment you open the throttle more than one third, the bike surges forward. At full whack, the amount of velocity this motorcycle produces is shocking. I managed to hit 100kmph in a mere 3.7 seconds. It could also manage to hit 210kmph before I had to slow down. Now that's some serious performance. It isn't inefficient either. In our testing cycle, the Monster had a highway efficiency of 23.7kmpl and city efficiency of 14.5kmpl. 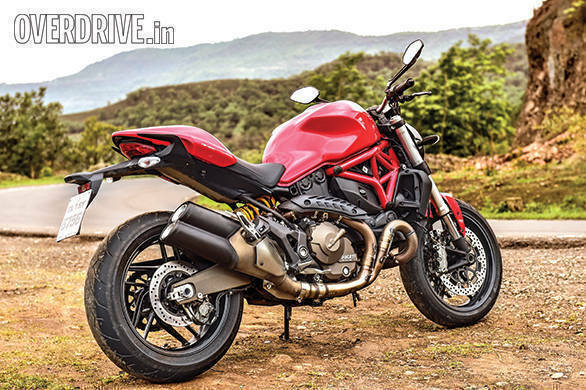 As I said before, the Monster gets three riding modes  Urban, Touring and Sport. Each gives you various levels of electronics intervention but can also be individually customised. Throttle response is very varied in the three modes with Urban also dropping power to 75PS. Urban mode is also the least fun. If you're used to riding big motorcycles, you won't like it. The throttle is not responsive at all. To the extent that it doesn't respond to blipping. A shame since this bike makes a fabulous noise. Touring mode improves on it a little bit but still feels very disconnected. The best is Sport mode. The response is quick without being too aggressive. In fact, it is very tractable. An extreme throttle would have had you jerking around, but the Monster doesn't do this. You need a gentle hand to make mid corner throttle corrections, but even these inputs don't upset the bike. And those electronics. Oh man, are they good or what! All traction controls are excellent safety devices. 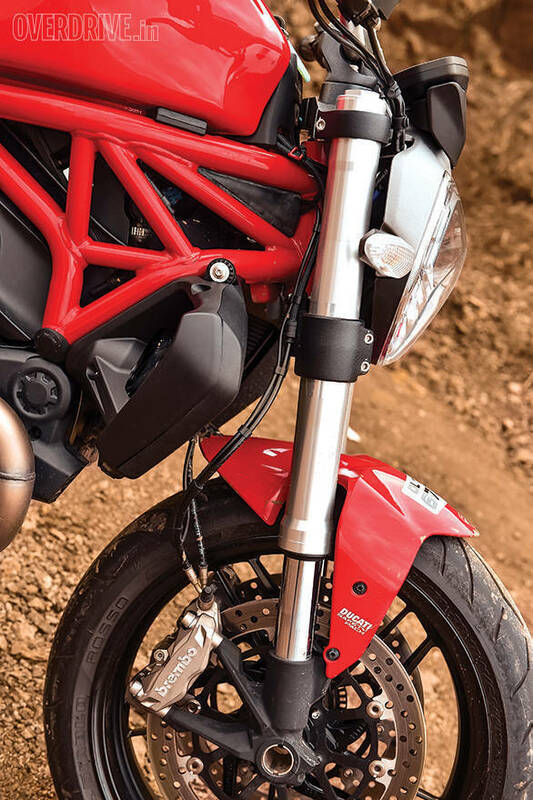 But the Ducati traction control is also so non intrusive that you never feel it interfering. The only sign of it working is the little light that keeps flashing on the speedo. It never cuts off all your power. It backs off the power till the unit knows you've recovered the lost traction. As all things Italian, including Monica Bellucci, the Monster has a sense of the exotic about it. It feels special. A lot of it has to do with that glorious soundtrack. But other than that, it is a superb motorcycle in its own right. Take away its Italian ancestry and it still remains an excellent motorcycle. It handles really well. It is blindingly quick and fast. And that noise. Oh my god! It gives me goosebumps every single time. It also comes with a very advanced electronics package. All this makes me overlook the finish issues that the Monster 821 has. But at Rs 13.49 lakh (on-road Mumbai), it is an expensive motorcycle. But then it is a Ducati. So you really can't expect it to be not expensive. But the extra money gives you a lot of soul. Blood red soul. And that you can't put a price on.